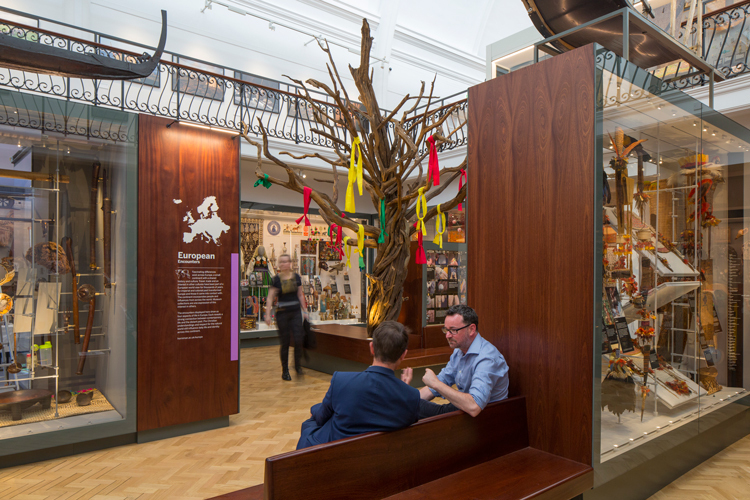 The South London museum has opened the World Gallery, a new space filled with thousands of trinkets from across the world, some of which are thousands of years old, from Native American weapons to ancient Thai novels. We look at how the gallery looks to spotlight the diverse range of people who created and used these intriguing items. Away from the bustle of London’s busy museum district in South Kensington sits the Horniman Museum and Gardens, a museum local to Forest Hill in South London. It began as an eclectic, personal stash of items belonging to English tea trader and the museum’s founder, Frederick John Horniman. Officially opened in 1901, it was a treasure trove of objects he had collected while travelling the world, including musical instruments and cultural artefacts. Over 100 years later, it has expanded, still holding many of the objects it did in 1901 alongside huge collections on natural history and taxidermy animals from across the globe. One of its best-known and most prized objects is the famous walrus, which has been in the museum’s taxidermy collection for over a century and appears comically large, probably down to some kind of over-stuffing error. 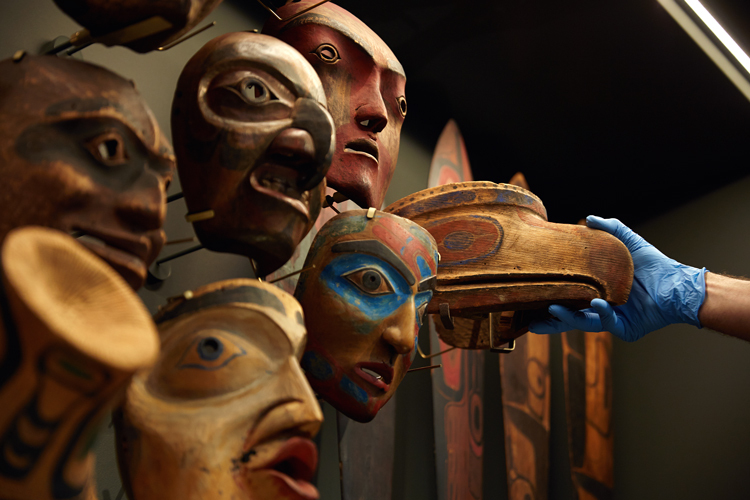 Now, the museum has opened a new gallery dedicated to anthropology, holding over 3,000 objects related to the movements and changing behaviours of humans throughout time. The huge new World Gallery has been designed by Ralph Appelbaum Associates, and features four spaces devoted to different sections. One section splits objects up across the world, looking at the five inhabited continents of Africa, the Americas, Asia, Oceania and Europe in turn. The four main sections of the new gallery include the Introductory area, Encounters, Perspectives and Horniman’s Vision. The Introductory area is the entrance to the gallery, and focuses on the emotional impact objects have made on people. A display of objects line the walls, while digital installations and videos show people from different communities talking about the items that mean something to them personally. 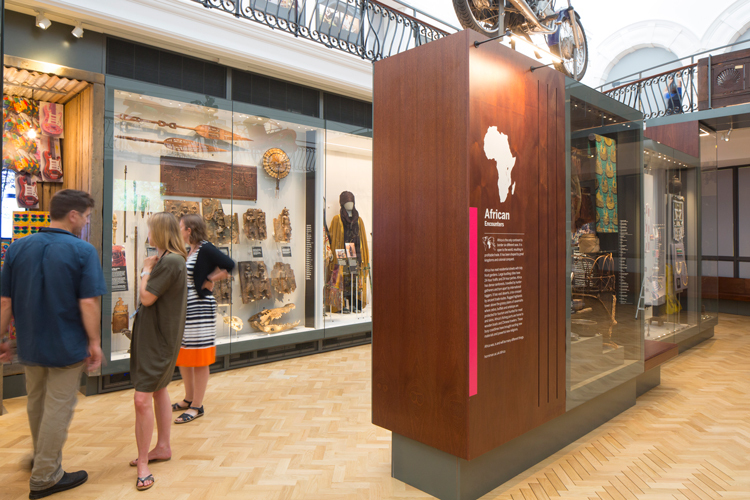 Encounters is the largest section, looking at the five continents, using past and present objects as a way to tell stories about different cultures. 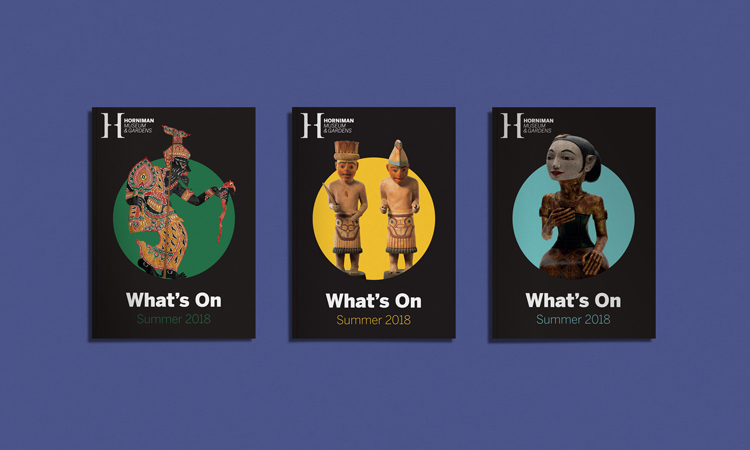 The items are varied – South African beaded waistcoats from the 1970s, Native American tomahawk axes, warrior headdresses from Nagaland, Pacific shells used as body jewellery and protective charms worn by First World War soldiers all feature. Alongside these, artists and designers were commissioned to create contemporary items for the space, such as a dress by Nigerian fashion designer Alafuro Sikoki-Coleman and an eco-helmet by New Zealand artist Chris Charteris, responding to climate change. Many of the objects are also there to be interacted with, including animal skins and materials that can be touched, Himalayan herbs that can be smelt and an Australian coral reef that can be explored digitally. 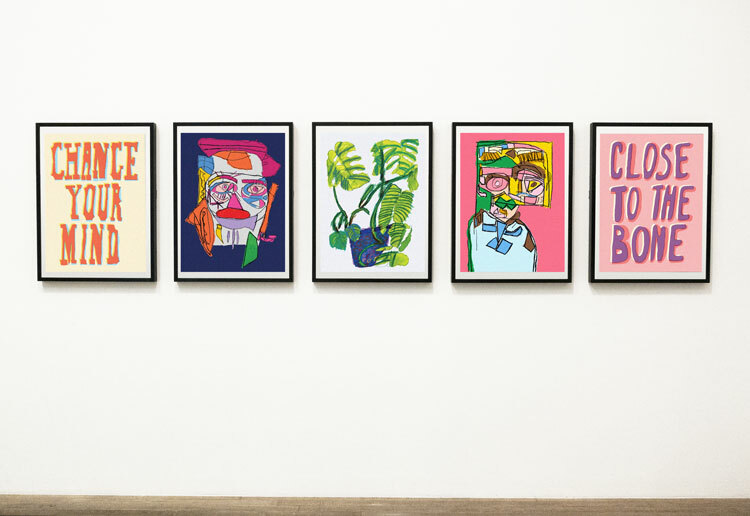 Tefft says it was important that the galleries centred around the voices and opinions of cultural communities, with curatorial voices coming afterwards. The displays in Encounters also take into account contemporary political and social issues, in the context of history – the Europe section, for instance, features a section of Boat 195, a refugee boat that was sent from Libya to Italy in 2016 carrying 253 people. This sits next to pottery that was traded across the Mediterranean between 300 and 700 BC. Comparisons such as these aim to demonstrate how migration and transport of people and goods have been happening for thousands of years, despite the current contention and hostility towards migration and refugees. 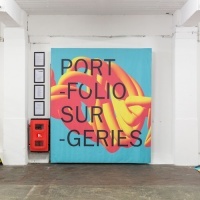 The next section, Perspectives, takes a more philosophical approach, asking questions of visitors such as what is anthropology, who decides what a collectible object is, and looks at objects from a diversity and inclusivity perspective, by presenting items created for those with disabilities and mental health issues. The final section, Horniman’s Vision, is the most historical, and gives visitors an overview of the museum’s history and the life of the founder. 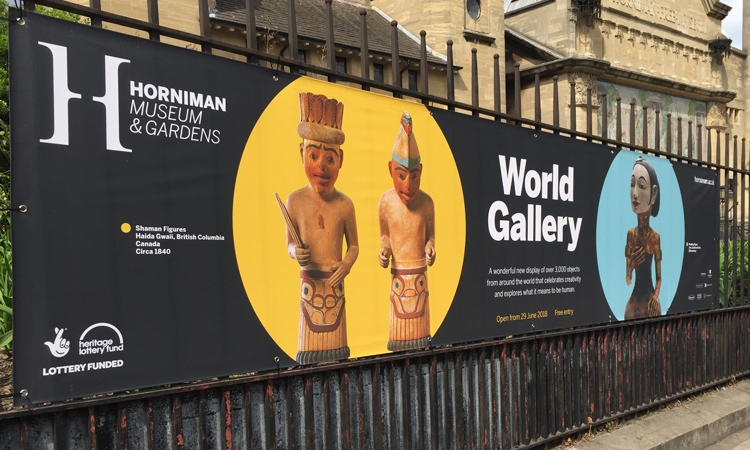 This space features some of Frederick Horniman’s personal collections, including artefacts from Ancient Egypt, and pipes and vases from around the world, and looks to celebrate the founder’s ethos in 1901 to “bring the world to Forest Hill”. 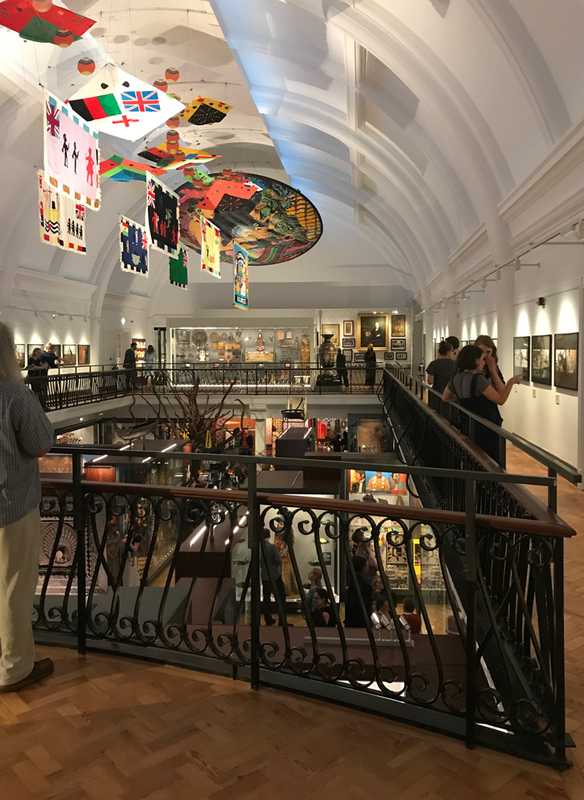 Two floors sit above the main gallery space, so visitors can walk up to the upper level balcony and “survey the cultures of the world below”, says Tefft. The space looks to symbolise the differences but ultimately the similarities between different cultures, he adds, by bringing them all close together spatially to do this. 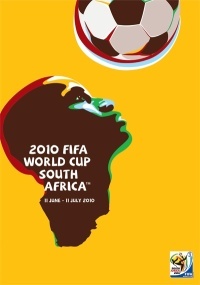 The designers have looked to achieve this with an “open” and “connected” layout, he adds, particularly in the Encounters section, where visitors will be looking at one continent while simultaneously able to see other continent displays, and have different viewpoints of the gallery. To make the 3,000-odd objects in the World Gallery the main focus, the design of the space has been intentionally “pared back” in terms of materials and colour palettes. 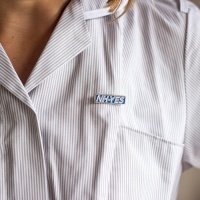 Wood panels are used to hold information, captions and text about the different sections, with copy set in a white, sans-serif typeface, alongside minimal imagery and single, striped colour graphics used to frame object displays. The use of sapele, a sustainably-sourced wood native to Africa, aims to create a sense of “warmth and human craftsmanship” in the gallery, while photography of people’s faces litter the showcases within the whole space. Ralph Appelbaum Associates also looked to make the gallery as “inclusive” as possible, by working with the museum’s access group, a panel of gallery visitors with disabilities who help to inform how spaces are designed to improve accessibility. Working alongside this focus group looked to ensure the physical displays, graphics and typefaces used in the new gallery would enable people with learning difficulties or disabilities to navigate the space, and read and see displays clearly. To coincide with the opening of the space, graphic design studio NotOnSunday created a print advertising campaign, which, like the new gallery, has looked to portray the “human” element through focusing on photography of objects featuring people. 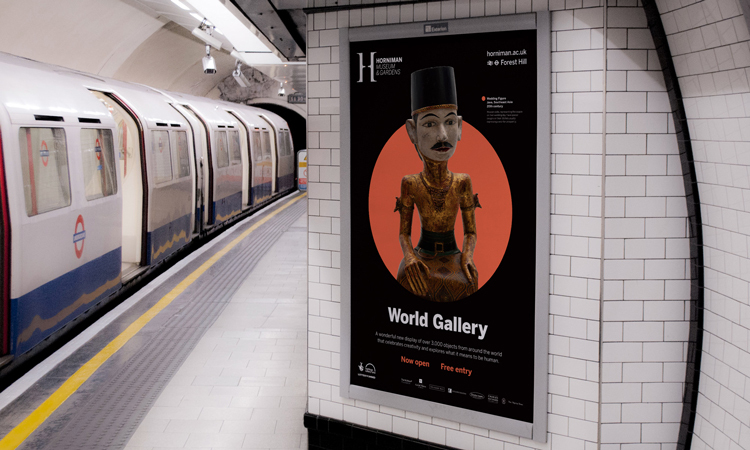 The campaign uses many of the existing branding elements of the Horniman Museum and Gardens, including the brand typeface Benton Sans and a heavy use of black, and looks to “hero” some of the “amazingly weird and wonderful objects” that are showcased in the new space, adds Townsend. “We wanted the campaign to be really striking and stand out, but also make it intriguing,” he says. With 3,000 new objects on display, visitors might be overwhelmed by the eclectic and diverse assortment of items and the stories behind them. 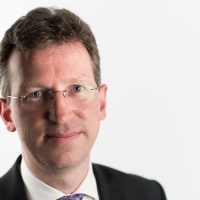 But ultimately, the aim is to encourage people to open their eyes to other cultures, embrace diversity and be inquisitive of things they previously had no idea existed, or no idea how they came into existence. 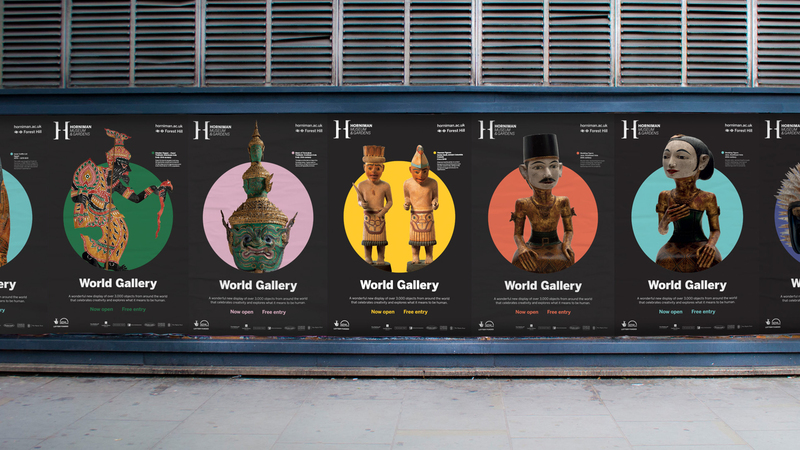 The World Gallery has been funded by a £3.3 million National Lottery grant, and is based at the Horniman Museum and Gardens, 100 London Road, Forest Hill, London SE23 3PQ. Entry is free. For more information, head here.